Learn 97 foolproof tricks with playing cards! The quickest, most certain path toward achieving a reputation as a magician is to be able to perform at a moment’s notice with playing cards. If you are handed a deck of cards you should be able to do at least one amazing trick with that deck. This book deals exclusively with just such tricks. It is a collection of some of the best card tricks with ordinary playing cards. The approach throughout the book is simple. No unusual dexterity, gimmicks or special sleights are required. The only props needed are playing cards. Nor are long hours of practice necessary. 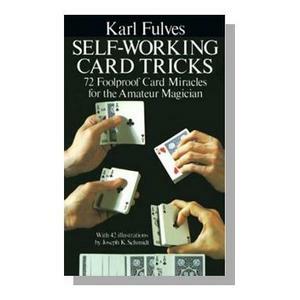 Step-by-step instructions and over 180 helpful illustrations insure quick and effective mastery of each trick. Paperbound, 122 pages, 185 illustrations.